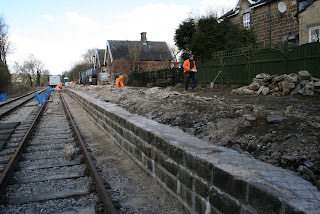 Anyone with any interest in our Railway should rejoice in the achievements of Mick Thomas and his permanent way team and Paul Rayner and his VCT as they reported completion of the Duffield platform extension project. 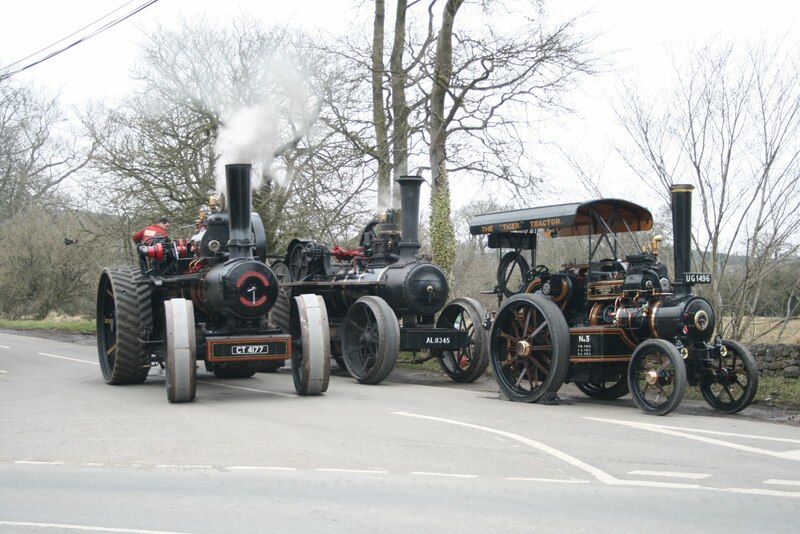 They have all achieved a minor miracle that will greatly aid the programme of visiting steam locomotives this year. Other miracles were being observed at Wirksworth as all three Mark 1 coaches were being worked on by an army of people with a whole host of jobs drawing to a conclusion from underneath the vehicles to ensure the brakes work, springs are oiled, doors open and close safely (with special thanks to Lee Sharpe), lining out, guards compartment floors painted, toilets filled with water, compartments deep cleaned and panelling varnished. First Aid boxes and fire extinguishers were also correctly positioned. Truly, a tremendous effort by all concerned. 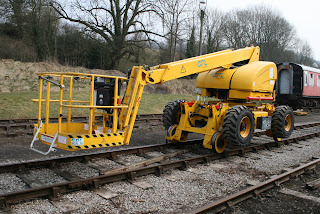 The SBT, with the help of Mick Billings and the Komatsu, achieved the positioning of the first three coping stones allowing the S&T van to move from north to south of the platform. This will facilitate the remaining wall at the north end to be demolished for rebuilding. Fred & Iris gave the Wirksworth Mess Hall their customary deep clean and the train service team looked after today's passengers which added a little to income generation. The miniature railway received some attention to the protective railings and some sleeper replacement, somewhat easier than the real thing! The VCT also dealt with a fallen tree and one that seemed due to fall between Duffield Tunnel and the A6 bridge with an attack some 300 yds north of the Duffield foot crossing on the vegetation there with their signature fire. The Pullman Buffet Car and Booking Halls at Wirksworth and Duffield looked after all our paying guests. A photo is attached of the three Mark 1s sitting in today's sunshine and a reminder that all operational staff are required for a Responsible Officer's briefing on Saturday at 0820hrs. Posted today on the web site is our latest culinary offering in the shape of a Fathers Day lunch in the Pullman on 16th June. It was coach day today with the LMSCA working on the BSK, the M1M working on the CK and Royal Saloon and a late turn shunt team marshalling the coaches at Platform 1 for ministrations throughout this week. The energy being put into this marathon coach restoration should not be underestimated as we will all be rewarded by the sight of our very own maroon train, steam hauled, from this Saturday. The Booking Hall and Pullman Buffet Car dealt with the usual quota of phone calls and hardy visitors who braved the chill wind to see what we have been up to. Many thanks go to everyone pulling out all the stops and more to make the coming weekend a sucess. A photo is attached of the shiny BSK after the application of lining, numbers and BR crest - looking good. A mixed day weatherwise with overcast clouds which gave us both rain & hailstone sbut it still failed to dampen the spirits of our numeous visitors on Derbyshires friendly railway as they traveled up and down the line in the warm class 122 bubble car. With lots of praise for both the pullman buffet and the train crews well done guys. The Dmu team helped shunt the Dmus around the yard and onto the pit road before moving the class 33 onto road 3 so further work can be undertaken,on it , whilst the rest of the group worked on the rubbing down and stainning of the woodwork on the 119. The duty conscripts worked hard cleaning the inspection pit and digging out the redundant post under wash green bridge.as anton was kept busy chipping away on the new gents toilet door Wirksworth station was also kept busy with both directors who had their monthly meeting and our shareholders who held their afternoon annual meeting the Red Lion. everything is now where it is supposed to be for the weekend. The LMSCA and Allsops painters were fully engaged. The class 33 was also being readied for some special maintenance tomorrow morning. In other news, the gents has had a new door as the old one was so rotten you could put your finger or various other things through it. The new door will require painting and while this is in progress the Spare Gentlemen will, inevitably, be round the corner. More strides forward as the Duffield platform extension has all its supports in place with thanks to the PWT and the VCT has largely completed the associated fencing. A tremendous achievement by all involved with great credit to Mick Thomas who has masterminded this solution to accommodating locomotive hauled trains without convoluted shunting. Wirksworth has not been without activity with work forging forward on the CK and BSK. The CK has benefited from interior ceiling painting and exterior gloss paint on the west side. The BSK has had further interior work as it approaches its exit from the Maintenance Facility. Graham and Doug have been wrestling with L J Breeze to ensure it can change direction without difficulty and I take my hat off to Rob who spent an inordinate time to facilitate tomorrow's shunting that will allow further progress with our Mark 1 coaches. The Pullman Buffet Car and Booking Hall continued to generate revenue. Another day of great endeavour with coaches and platforms featuring. The Royal Saloon had some welcome attention to its interior panelling, the CK to its compartment presentation and the BSK to its exterior gloss. Everyone involved is pulling out every stop to make these vehicles as presentable as possible for next week. The PWT descended on the Duffield platform extension again with great results and the SBT reported a further 30ft of concrete top and 36ft of backfill before running out of tasks for today. The LCC cleansed the Bubble Car and gave my office a spring clean to its great surprise. The Head of Gardening tended to the flower beds along Platform 1. The Booking Hall and Pullman Buffet Car looked after our visitors and advance bookings received online. PS - We are aware of some of our shareholders may have not yet received the Annual Accounts for Saturday's Company AGM due to postal delays. The document is available on our website www.e-v-r.com in the section devoted to the share prospectus if you are without! As ever Tuesday is an exceptionally busy day of the week. The service train crew obliged to a late request for Richard to man L J Breeze and Matt willingly undertook his third man duties for the first round trip. Passenger numbers were well within the capabilities of the Bubble Car and Iris on the Incline runs. Richard and Rob stepped in to a complex set of stock movements allowing the CK to enter the Maintenance Facility, 33035 to wait in the Car Park for a lift on Saturday, the untouched SO and SK to move to the Carriage Siding for future ministrations and the previously restored SK and Royal Saloon to shine quietly next to the Pullman. A photo is attached to illustrate 50% of the future locomotive hauled set. The DST concentrated on the final preparations of Henry Ellison, preparation of No3 for Friday's driver experience day and greatly assisted with the braking system on the CK. They had a Mutual Improvement Class in the afternoon as part of the preparations for the visiting Collett. The M1M continued with the interior and exterior preparation of the CK and the LMSCA made more progress with the doors and the interior of the BSK. Two coach restoration teams working in harmony. Fred & Iris treated the Mess Hall to a deep clean and the VCT fenced around 50% of the platform extension at Duffield, a quite remarkable achievement in a day. The SBT dealt with a further 30ft of course work at Shottle together with some 45ft of back fill. 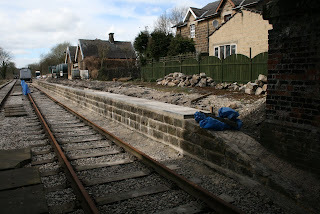 They reached a milestone of the refurbishment of 200ft of platform retaining wall leaving some 60ft to go. The PWT made great strides with the construction of the Duffield platform extension with every prospect that this project will be completed before the 3rd of May. At base, the EVRA shop was open for our passengers together with the Pullman Buffet Car and Booking Hall. PS Many, many congratulations to the catering team for last Friday's first ever themed night. The curry went down well and over 40 customers enjoyed their evening with us generating 16 advance bookings for the next adventure of a Pie and Peas Quiz Night. A lot of hard work but a significant financial result for our enterprise. the top of the embankment. and minor snagging of the interior. called to account for why you left such materials there in the first place. you read it during your breakfast). no doubt the first stage in the long road to recovery for this vehicle. The Permanent Way team were the stars of today as they completed the very necessary work in the Barnsley Lane area with a late finish allowing the line to be used again. There remains some tidying up work but I do thank everyone who responded to quite a big ask. 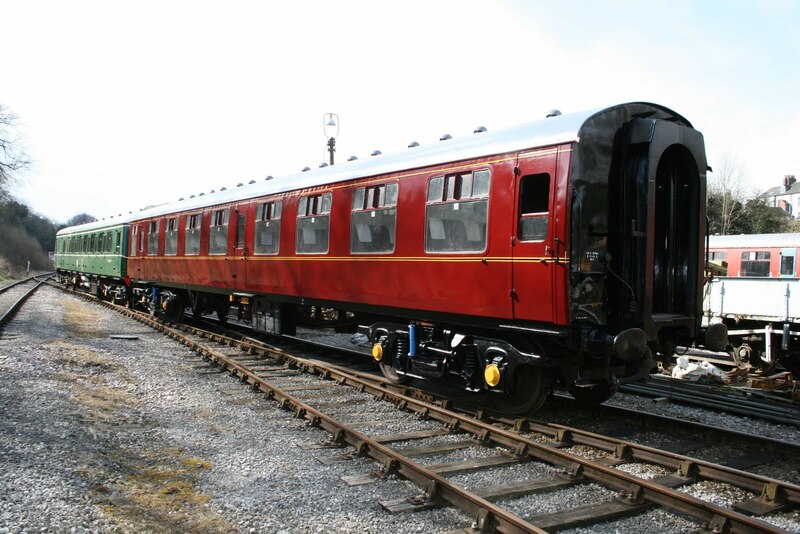 Things were not quiet in Wirksworth as Graham and the dmu team replaced the defective vacuum cylinder on the Mark 1 SK followed by a test that proved the repairs were satisfactory. There was a little gentle conflict with the LMSCA team and Allsop Enterprises as they all progressed the repairs and paint preparation on the Mark 1 BSK. This vehicle has required major surgery and it will be a great tribute to all involved if it is delivered in time. The work involved has a knock on effect on the Mark 1 CK which is a vital part of our locomotive hauled set as it will need a final paint undercover. Given that it is less than two weeks before all the vehicles are required it will test the resolve of everyone involved and the stress levels are noticeable. 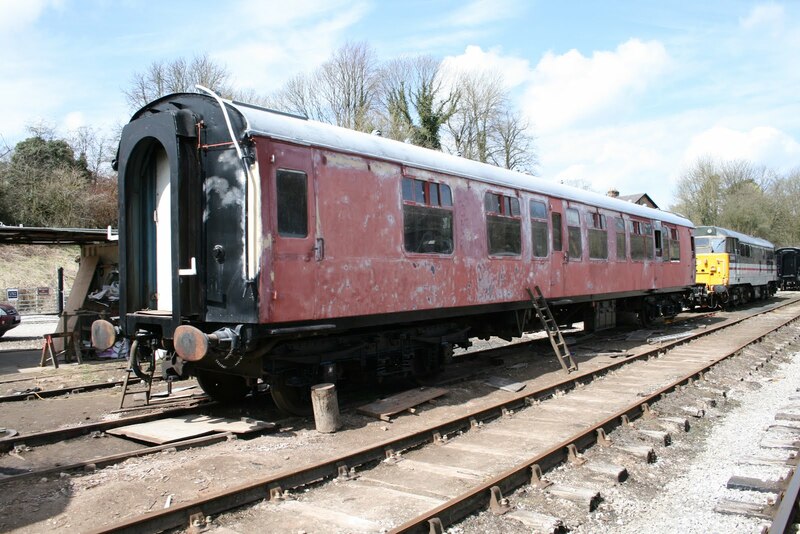 There was filling and sanding of the Class 119 which the team have decided will be outshopped in blue and grey reliving its time on the Reading to Gatwick Airport service. The VCT called a halt to their work at Shottle and started the preparations for the necessary fencing along the Duffield platform extension. Two customers arrived for small tasks. A further "walking stick" calibration exercise together with initial tests with radar for Transport for London together with a well known engineering Company using our facilities for internal vehicle examination assessments. All seemed to have had a satisfactory day. I met, again, with the solicitor acting for Miss Bell about the access footpath at Shottle were, again, I felt all the issues were resolved. We shall see. I took the opportunity to take a photo of the excellent work being undertaken there on the platform reconstruction. The Pullman Buffet Car and Booking Hall had a pleasant stream of visitors. The major task today, and tomorrow, is to try and remedy the track geometry in the Barnsley Lane area. This project has been on the books for quite a while and programmed, frustrated, programmed again, frustrated and programmed again to be very nearly frustrated by LJB today but the collective minds and Graham in the background enabled the work to proceed. The photos taken by Richard illustrate this work that has started to absorb our ballast store in Wirksworth Car park from a Balfour Beatty test. The team returned in the late afternoon visibly creaking and our collective thanks must go out to them as this work needs to be complete to allow our visiting engine to travel the line. No track, no trains! The LCC gave the Bubble Car a good cleanse and embraced the Training Room in her endeavours. Allsop Enterprises recorded an 0715 arrival on site and with the help of Mike Evans completed the painting of the roof of the BSK. Much filler was also applied to the west side of the vehicle and the east side was washed down for the first pass of gloss. John is certainly pulling out all the stops to make this coach ready in time. A large crane arrived to remove The Duke's boiler from its chassis and positioned it for further work including placing the water tanks along side. Tim Oakes was last seen painting the interior of the Palvan which seemed to have some interesting graffiti relating to Swindon and its occupants. Given the vehicle had arrived from Scunthorpe there seemed to be a disconnect. The SBT reported that some 33ft of backfill was achieved and 30ft of concrete block top placed on the platform ready for the coping stones. The Head of Gardening tended to the embankment garden at Wirksworth together with a small planting in the Platform 1 raised bed. Both the Booking Hall and Pullman Buffet Car received a steady trade through the day. 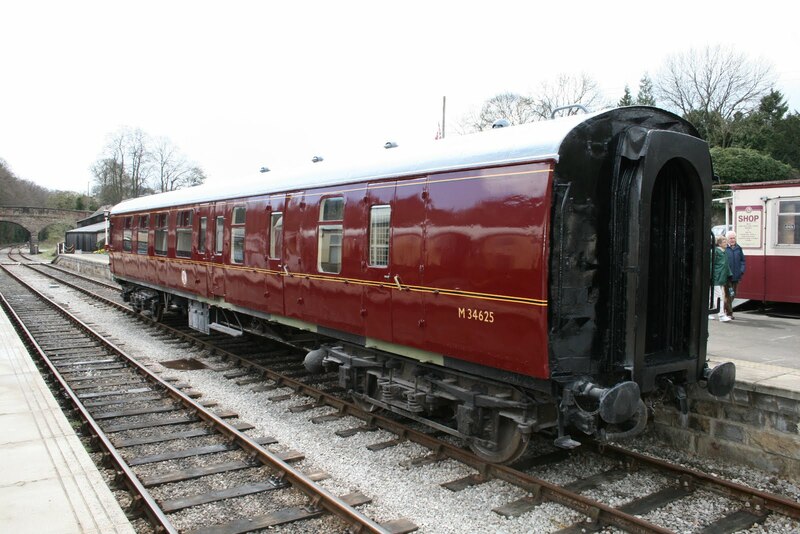 There is a growing mild panic as the teams restoring the vehicles that will form the rolling stock for our steam hauled trains in May realise there is two weeks to go! The LMSCA made feverish progress with the Mark 1 BSK with major surgery to doors, interior varnishing and bottoming the south end corridor end door so that it can be opened and closed. The vehicle was shunted from the west side to the east side of the Maintenance Facility with the eager co-operation of the dmu team. A defective vacuum cylinder on the newly painted SK was removed for renovation and the CK had its new "Marmolium" laid reflecting great credit on Rod and Mary. Its present exterior condition is shown reflecting all the preparation work that has been so far achieved. The rest of the track patrol was completed with Duffield to Shottle and the Wirksworth to Idridgehay sections undertaken. A message from these dedicated folk elicited the fact that "house martins were spotted at Barnsley Lane". I was not sure whether this was a message from the Cold War era or should be relayed to the RSPB. The DST undertook general maintenance of No3 for its driver experience day on Friday and continued to tidy up Henry Ellison for its launch day. 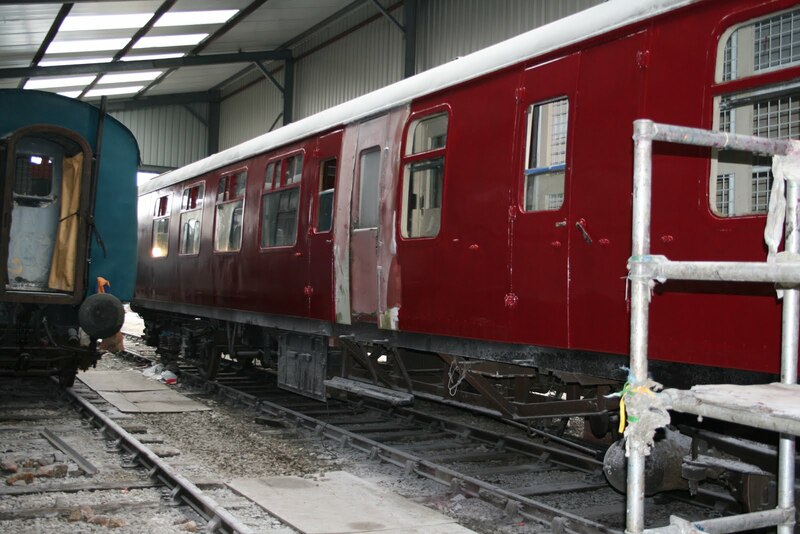 The dmu team also spent a great deal of team moving the BSK from the west side to the east side of the Maintenance Facility to enable Allsop Enterprises to maximise his painting over the next two days. The VCT made great strides with the Shottle station fencing together with opening up further view on the "down" (west) side of the line in the station area. Fred & Iris lifted the condition of the Mess Hall and the EVRA shop had quite a profitable day. We saw the arrival of a new vehicle which will act as stores for The Duke. I believe it is a former "Palvan" which were designed to accept palletised loads but were intrinsically unstable above around 45 mph causing their early withdrawal. Oakes Enterprises will need to get their paint pots out! The service train team had to compensate for the failure of the guard to attend and the absence of a third man, a disappointing occurrence as without income we can achieve nothing, and my thanks go to Patrick, Tom, John and Eric for coping with the day. The SBT reported a highly successful day with some 45ft of course work achieved, 33ft of backfill, 30 coping stones moved and 180ft of platform cleansed with the aid of the VCT to allow the final platform layer to be applied on this section. The Pullman Buffet Car looked after today's visitors and now have 44 bookings for the upcoming Curry Night. With is successful response another night is now on offer on Friday 17th May which will be a Pie and Peas Quiz Night, all bookable on line. The Booking Hall served today's clients, dealt with enquiries for the future and turned attention to our plan to directly market our own Experience Days. Bookings for Curry Night at the Pullman Buffet have been so brisk, they have decided on their next themed evening. Introducing Pie and Pea Quiz Evening at Wirksworth Station on Friday 17th May 2013. A meal of pie and peas with homemade gravy served with a glass of beer/bitter or red/white wine (soft drink for children), followed by a themed quiz with a prize! Food will be served at 18:30 followed by the quiz later in the evening. Pre-booking is essential and can be done online at www.e-v-r.com/shop/product/46 . A peaceful Monday with a few tasks achieved. On their third try, the first two being defeated by the snows, Alfreton Park Community Special School had their planned charter to and from Idridgehay. Very ably hosted by Lewis and two Erics the school had a brief time in the Pullman Buffet Car before embarking on their journey. The M1M consisted of one as he wrestled with the application of "isopon" to prepare the exterior bodywork for painting. Tony got a head start on the active pw week by patrolling Idridgehay to Shottle and the Incline. With an eye to the present economic climate he also gathered up a haversack full of spilt coal from Friday's experience day - what a champion! The LMSCA attended to further progress the Mark 1 BSK. The Booking Hall fielded the usual phone calls interspersed by a good helping of Radio 3. A rather blustery day, but at least it was vaguely warm here today. We pottered around with our passengers and visitors, and in between these the Booking Hall carried on with the mammoth envelope stuffing process, so that many of you will receive the Annual Report, that wonderment of accounting exactitude, in a very soon moment. The Head of Gardening gardened at Wirksworth and the Station Foreman at Duffield mowed several parts of the garden at that fine station as well. cleared ready for a coat of paint on Tuesday, and in the class 119 the cab doors were also painted. 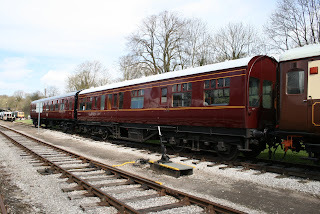 As The snn shined on Derbyshires friendly railway we had a steady stream of passengers who all had a nice pleasent day traveling up and down the line before sampling the daily delights of the pullman buffet which was also busy taking more booking for the curry night on friday. Late in the afternoon the smokey smell of steam engines drifted over the railway as four traction engines crossed wash green bridge tooting and waving to the passegers and staff on the platforms as they headed up the hill following the aroma coming out the Malt shovel. The two daily conscripts found themselves getting involved in the cleading of the oil seperator and soon found out that their arm muscles do actualy work. Anton was to be found digging for water in the station 6 foot but decided instead that putting a box and hose pipe in would fill the coaching stock quicker than a bucket. 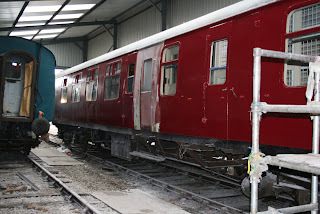 The Dmu group worked their little cotton socks off as they welded the guards area and fitted the first class seats. Young Jake helped with the painting of the fencing along the ramp , Matt was to be found working on the evra coaches both doing a sterling job. Graham and Rob fired Breeze into life and managed to coax her to move and complete a minor shunt before replacing a seal on iris and tested her on the incline. The Lmca were like busy little bees in the shed as they worked hard on preparing another coach ready for the May Gala. 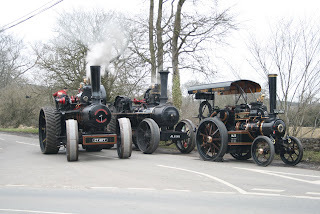 Worn out by Saturday's rostered house cleaning day I was shocked to hear the sound of steam outside the back door. On closer examination and a visit to the Malt Shovel to celebrate I noticed the presence of the Head of Gardening and Guard Hills spotting this unexpected phenomenon. I wish I had heard them coming up the hill from Wirksworth as there were eventually four of these delightful machines en route for Cromford. included the joy of shunting at Duffield and at Shottle. re-flooring. I am advised that as the mechanism to remove said bitumen is the application of parafin, that unless you wish to visit Uranus by the miracle of parafin powered space travel, that naked lights should not be used in the CK until it is thoroughly aired again. doors. In addition Allsops Painters and Decorators filled and sanded a large number of dents and dips which this vehicle has accumulated over time and a significant investment in another giant economy pack of filler will be made shortly. multi-million pound inter-platform carriage watering facility will be buried flush with the ground in a very soon moment. Will Booking Hall staff please note that after a trip to America, the DVD player in the Museum now has to be turned on using the remote, and by pressing the Green Button then the Red Button on the front of the unit. I missed thanking the engineering team for all their efforts to fit the repaired starter motor to L J Breeze which has restored the loco back to traffic. They also achieved the not inconsiderable task of replacing all 16 of the brake blocks on the recently outshopped SK and made progress with preparing the east side bodywork of the Class 119 for painting. The LMSCA added to the varnish work inside the Mark 1 BSK. It's difficult to know where to start as today has been very different from our usual Thursdays. However, there is a correction and clarification from yesterday where "conventionalise" (accepted by spell check) should have been "conceptionalise" - you probably nodded off by then. 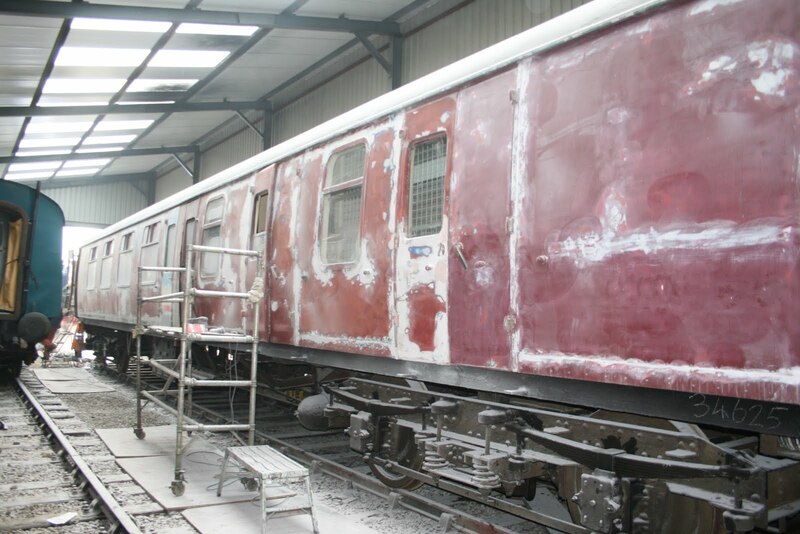 The M1M were out in force to move the CK forward and Allsop Enterprises moved the BSK from anti-corrosive green to maroon undercoat on the east side. This was with the exception of the guards door area which have major surgery on Saturday. A photo of this remarkable transformation is attached. The PWT dealt with an outstanding problem with the most northerly points on the line beyond Cemetery Lane bridge so that it will be perfect for the run rounds of our visiting steam locomotive. It was delightful to welcome two customers on site today with the first having a training day for their salesmen. This consisted of a morning in the Training Room, lunch in the Pullman, a trip to Idridgehay in the Bubble Car followed by a practical afternoon with track tools under the supervision of Mick Thomas. The second customer was a straight forward "walking stick" calibration exercise adding to today's revenue. A report from Duffield revealed that we now have a station clock and there was the first of two briefing sessions for operational staff on the forthcoming steam gala in the Mess Hall. The LMSCA continued to varnish the interior of their BSK and everyone involved in the coaches renovation project is feeling the pressure of the need to be available in the next few weeks. The Pullman Buffet Car had a most satisfactory day as its daily opening is gradually attracting a very new market and the Booking Hall tended to the ever ringing telephone, taking another Curry Night booking and completing a further box of envelopes for the AGM mailout. The feeling is that the world is coming to life after a long, bleak winter. Another day of great adventure with a test customer bringing not one but three "cherry pickers" for test and evaluation. They were ably looked after by JHT and seemed to have had a satisfactory day with us. One of the machines is featured in today's photo. The LCC gave the 2 Car set a good do and Allsop Enterprises made great progress with the BSK applying anti corrosive green to east side and putting a lot of filler into the west side. Within the vehicle the LMSCA tended to varnishing and door hanging bringing this former "wreck" to life. The Head of Gardening tended to the station gardens at Wirksworth and the Class 119 also enjoyed some body filling. The Asset Manager had a session of being mentored on structure maintenance repair techniques by a most helpful Network Rail representative which will allow us to complete some of the many works needed in house. The Filing Fairy was also in attack mode as personnel files were brought up to date and guards journals evaluated. The SBT reported on this week's productivity with 24ft of course work completed, some 57ft of backfill achieved and 27ft of the penultimate block layer at the south end of the platform. This last part of the project brings the platform height to the correct level for the reapplication of the coping stones. The PWT concentrated on further development of the Duffield platform extension. The Pullman Buffet Car had quite a busy day with the passing trade of walkers and our test customers. The Booking Hall seemed to have an unending steam of telephone calls and began to conventionalise further on line products. We have certainly got the decision to run every Tuesday right as today entertained an audience that required a mid-day substation of the Bubble Car by a 2 Car set. My thanks go to the train crew, the Booking Halls at Wirksworth and Duffield together with the Pullman Buffet Car who managed to nudge us into a four figure take. Amazing for the second week of April and gives a clear steer as to the way forward. There was a legion of other activities around our empire and these are listed in no ranking of importance! However, the work of the PWT at Duffield who have erected one third of the new platform supports has quite an impact on our future. Equally the work of Allsop enterprises on the LMSCA Mark 1 BSK project ranks highly as we approach the May deadline. The laying of the corridor linoleum has, again, lifted the vehicle. This interior work and exterior of this vehicle is transforming it double quick time. Its present stage of transformation is illustrated.The M1M also strode forward with the CK as they dealt with interior panelling, further luggage rack stringing and exterior preparation. The SBT were in action and the VCT made further inroads to the Shottle area vegetation. The dmu maintenance team pressure washed the bogies of the 2 Car set to good effect and Henry Ellison was steamed and moved to a less dusty area which allowed it to have a few test runs on the Incline. The DST also worked on No3 after its three days of use with experiences, shunting coaches into position and delivering material to Duffield. 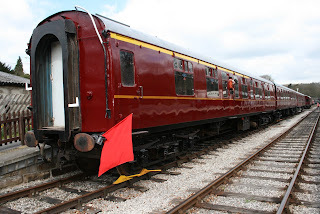 Bookings for the curry night have reached 24 and online bookings for the first and Royal Saloon flow in for the May steam event. Preparations for our second Pensioners Wednesday Lunch Day were well in hand and we are ready for two test days to come this week. The EVRA shop had record takings on the back of today's great passenger numbers. Progress Mon 8th April 2013. A busy day for p way today tripping all the material to Duffield for the platform extension. 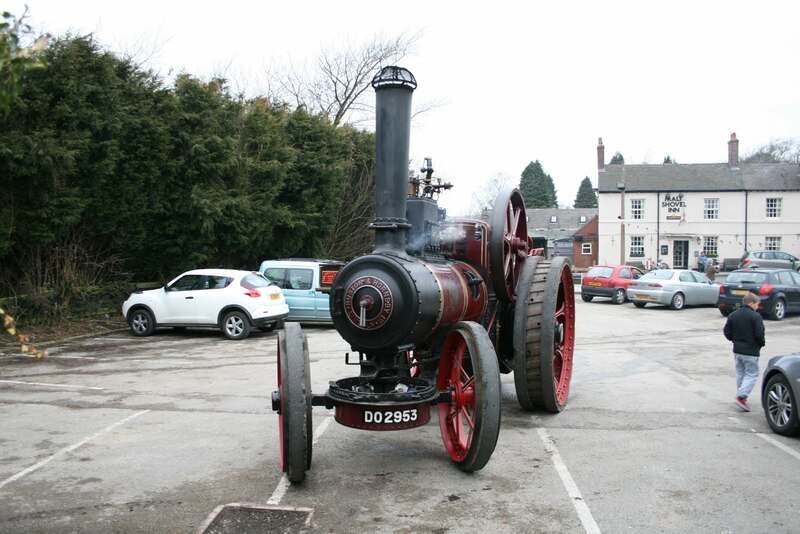 With Breeze out of action again we had to call on steam traction to save the day. Many thanks to Hilton and JHT for turning out early and a late finish. Sorry but the loco will have to be disposed on Tues as the crew had done 9 hours already and with no other help forthcoming there we are. Thanks to Bob and Vince as well for crossing keeper and guards duties. Logistics again have been a nightmare with lots of other jobs to complete plus two testing customers to deal with later in the week and trying to get all the timber, nuts, bolts, washers paving slabs and chippings delivered to site by Tues meant my Sunday was spent manufacturing brackets for said platform so when the steam crews alight from their loco at Duffield and feel the silky, delightful timber platform under their feet which means they don't have to bother with all the performance of shunting the train about then perhaps they may spare a thought for the sacrifices made by others on their behalf. Talking of unsung heroes saw LMSCA here again today doing battle with the BSK under the spectre of a fast approaching deadline. Allsop painting corporation was also present along with DMU gaffer Mike Evans doing coach and DMU things although by the time we returned they had flown the nest so I am bereft of detail. Rodney was also present at Duffield sorting more top soil from the pile of spoil near to our entrance. A very positive day with all going smoothly to plan with even the Komatsu not sulking for once though I suspect the picture of a set of cutting equipment in the cab is having some effect. I have also commissioned a voo doo doll of said komatsu and intend to cut bits off it at random with a hacksaw as my mood takes me. A lovely spring day in the Gem of the Peak which brought out a number of visitors to the trains and the buffet. The Class 31 and Class 33 both received routine maintenance. Henry Ellison had final paint applied. The DMU team also painted their cab doors. The duty conscript started painting the ramp fence and the CK had paint applied to its bogies. This frenzy of painting reached a crescendo on the roof of the CK which is now delightfully grey. After a cold start to the morning Derbyshires friendly railway settled down to looking after oursteady stream of contented pasenger who all enjoyed their trip down the line to Duffield and up to Ravenstor in the class 122 bubble car before their visit to the pullman buffet where the munched their way through the varied food on offer. The 8f group helped in the movement of katherines wheels in and out of the shed again many thanks to them for their help. Two test customers on site today with the first completing their driver training programme and the second undertaking training on their "walking stick" project. The VCT worked on the pedestrian entrance to Shottle and assisted with winning our long running battle over the access. Our neighbour and her solicitor have thrown in the towel after a protracted debate and we are now free to have a logical route to the platform when the station reopens. I do like when a plan comes together! Allsop Enterprises completed the SK and she is seen in all her glory whilst briefly leaving the Maintenance Facility before returning for application of numbers and crests. I am sure you will agree this vehicle looks very much "ex works". The PWT concentrated their energies on completing the work north of Cemetery Lane bridge to ensure the run round for our visiting locomotives will be safe. The ground conditions were quite unpleasant as the snow gradually melts making a straightforward job difficult. The dmu team were in maintenance mode and prepared Iris and the Bubble Car for this weekends services - an unique opportunity to see branch line life from the 60s. The M1M had an active day on the CK with the east side being prepared for painting, luggage rack re-stringing, interior panelling renovated and some welding underneath the corridor floor. I had sadly missed the Filing Fairy's contribution yesterday which, as ever, is so necessary in this day and age. For those of you interested in steam operations No3 will be active tomorrow on steam experiences, shunting the Yard at Wirksworth Saturday afternoon and gently trundling down to Duffield on Monday with the Works Train conveying materials for the Duffield platform extension. We have a lot to do to ensure the Collett visitor will be a success. The unsung heroes of Shottle feature today as they have achieved some 60ft of course work this week together with 20 to 30 ft of demolition and tidying up to consolidate progress so far. The quality of the work is illustrated in the photo over 150 years after the original construction. The end product will be another structure with a further 150 years of life! Our test customer returned for a two day programme of driver training which seem to proceed at a manageable but leisurely pace. The PWT conducted a planned whole line track patrol, completed further work at Cemetery Lane together with the timber work for the Duffield platform extension. Allsop Enterprises finished off the lining out of the SK allowing for the planned movement of the BSK into the "paint shop". 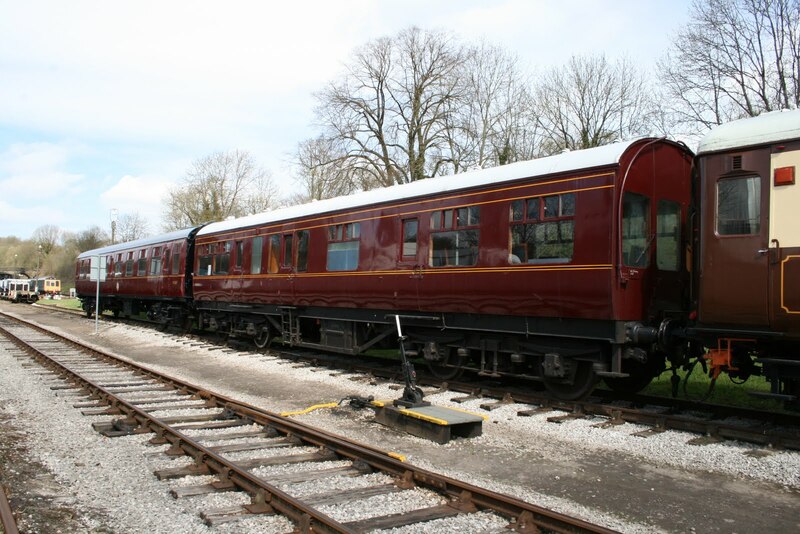 The LCC cleansed the 2 Car set and "Bubble Car" that saw activity over the five day Easter period. The Head of Gardening contended with yet more dog poo to tidy up the station garden at Wirksworth. If the suspected dog passes by when the Head of Gardening is present it will get a very good talking to. The Booking Hall had encouraging enquiries for the May steam event together with processing on line ticket sales. The Pullman Buffet Car benefited from the many people involved into today's testing. Another epic day with the first of our regular Tuesday services making a good contribution to revenue and boosting the performance of the Pullman Buffet Car. My thanks go to all the team on trains, in the Booking Halls and in the Buffet Car for their efforts to add to the coffers. The EVRA shop opened in recognition of this service day and Fred & Iris gave the Mess Hall a good clean. The DST prepared No3 for its driver experience role on Friday and completed some snagging on Henry Ellison. The SBT continued their good work on the platform reconstruction and the VCT made further progress with the access to the platform and thinning out the vegetation opposite the establishment. The PWT divided into two parts with one team beginning to replace sleepers on No1 road north of Cemetery Lane bridge as part of the task to ensure the run round facilities for our visitor in May are up to scratch. Part 2 of the PWT completed all the "legs" for the Duffield platform extension. The M1M dealt with doors, scraping off surplus interior paint and (lots) of interior panelling renovation together the refitting of vacuum cylinder two as the CK gallops towards completion - a long way to go yet though. The LMSCA concentrated on their Mark 1 BSK with running boards being fitted and much interior varnishing.There is a tremendous amount of energy being put into the project to prepare three good quality coaches to work with the Royal Saloon to form the train to be hauled by our first visiting engine of the year. More alarming news is that the Class 33 has a major fault that will see it out of commission for some months and L J Breeze awaits repairs to one of its starter motors. Some of you may have wry smile as steam will feature in its traditional role shunting the yard on Saturday and moving a works train on Monday. A very quiet start to the day belied the influx of passengers from the Duffield end that continued through the morning and early afternoon. Mary's Easter Egg hunt, or Saint Mary as she will be called henceforth, entertained a vast range of children from the well behaved to the loud complainers in a most measured and ever so pleasant way. The EVRA shop, Model Railway, Booking Halls at Wirksworth and Duffield together with the Duffield and Ravenstor train crews kept the show on the road with the Pullman Buffet Car acting as the warm support act leading to a satisfactory end to day 4 of our earning opportunity. Our revenue for the four days now equals that of last Easter when the weather was warm and lovely reflecting great credit on all involved. The M1M continued to battle with the CK despite not being able to undertake their planned paint of the roof due to Derbyshire's micro climate of snow flurries but concentrated attention on the interior panelling. Allsop enterprises continued to draw the repaint of the SK to conclusion and Dan finished lining out Henry Ellison. There was major surgery to the Class 119 which involved cutting the roof in the brakevan area and rewelding to remedy some damage done when it was residing in a scrap yard. The 119 team also worked to complete the drivers desk with its myriad of electrical connections. The seating so far installed is of an extremely high quality which may prevent passengers ever leaving the vehicle. A small trespass incident was dealt with as man, 5 year old and dog set off from Wirksworth towards Gorsey Bank announcing "I have always done this". Gentle debate extracted a promise that "he wouldn't do it again". My thanks go to everyone who looked after our paying guests in continuing sub zero temperatures.